Harrisburg, PA – Governor Tom Wolf today rejected the Republican budget that cuts $95 million from education and is out-of-balance, while directing emergency funding for key services. Last week, Republican leaders walked away from a historic bipartisan budget agreement and passed an irresponsible budget so they could return home to their districts and take holiday vacations. 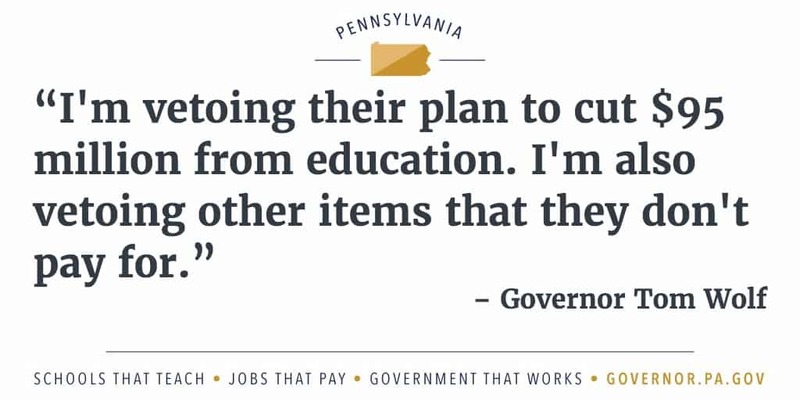 Governor Wolf vetoed parts of the budget because Republicans did not pay for their spending and to ensure a more responsible budget, but he is taking action to ensure that schools receive money owed to them through December 31. Governor Wolf limited emergency funding to a half-year appropriation (based on the agreed-to bipartisan budget) for basic education funding, state corrections institutions and medical assistance capitation. In total, the governor released more than $23.3 billion in funding. Further, the governor rejected the legislature’s desired increases for their own funding and instead reverted their appropriations to flat funding from the previous year. Community colleges, state system institutions and other higher education lines are also limited to flat-funding from the previous year. The legislature left for vacation without passing appropriations bills for state-related universities, Penn State, University of Pittsburgh, Lincoln University, Temple University, and the Penn School of Veterinary Science, and other “non-preferred” institutions. The Republican budget underfunds education and uses gimmicks that will actually lead to a $95 million cut in funding for our schools. Republicans continue to refuse to adequately fund Pre-K through 12 education and their budget fails to fund $305 million in school construction reimbursements. Instead, they claim to pay for school construction by issuing billions in new debt. However, since the Republican budget fails to take any meaningful steps to fix Pennsylvania’s structural budget deficit – which has already led to five credit downgrades – the commonwealth will be unable to responsibly issue any debt to cover school construction reimbursements this year and likely into the future. The Republican’s failure to provide school construction funding to local school districts and the commonwealth’s inability to responsibly issue debt will lead to a direct cost to the school districts, which will wipe out any marginal funding increases for local school districts. This means that their budget is an effective $95 million cut to school districts after years of cuts under previous Republican budgets. The Republican budget continues the trend of not only underfunding our schools but also fiscal irresponsibility that have led to massive structural deficits and multiple credit downgrades. Now, those decisions will have a direct impact on our ability to pay our bills and issue debt. To view the general fund tracking run, click here. As Governor Wolf has warned for months, Pennsylvania is facing a massive structural budget deficit as a result of years of Republican budgets that were out of balance. This multi-billion dollar deficit cannot simply be wished away. The Republican budget is not balanced and will grow the commonwealth’s multi-billion dollar deficit. This budget spends $30.3 billion dollars without sufficient revenues to pay for it. Assuming that we would certify the current year revenue estimate at the amount recommended by the Independent Fiscal Office earlier this month, if the governor signed this bill, the commonwealth would end the year over a half a billion dollars out of balance with a structural deficit of over $2.3 billion. While Republicans may claim that they have finished the job, they have not. They have not paid for the budget they passed, which would further increase our deficit that stood at $2.3 billion earlier this year.